This unique site of Dinosaur footprints is located on the farm Otjihaenamaparero 30 km from Kalkfeld on road D2414 in Northern Namibia. Alternatively it can be reached turning right off the main B1 road into D2404 (signposted). Turnoff to the site is also signposted. The site was declared a national monument in 1951. 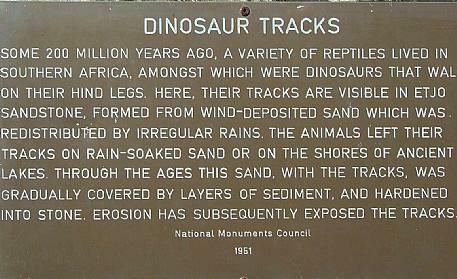 The existing well visible prints are of two-legged three-toed dinosaur. Approximate age of the prints is 160 million years. The prints were left in the red Etjio sandstone at the time it was a soft clay. The prints can be traced for about 30 metres. There is a camping site near by and fees are payable at the farm house.